The historic Lehigh Valley Trust Building was designed to embody an era of great hope, aspiration, and progress. Its magnificent details have been inspiring guests since its doors opened in 1911. The historic façade is adorned with Corinthian-style pillars and intricate marble details designed to impart a powerful first impression. Regal stone lions stand guard over the antique brass doors, which serve as a breathtaking portal to the Gilded Age within. 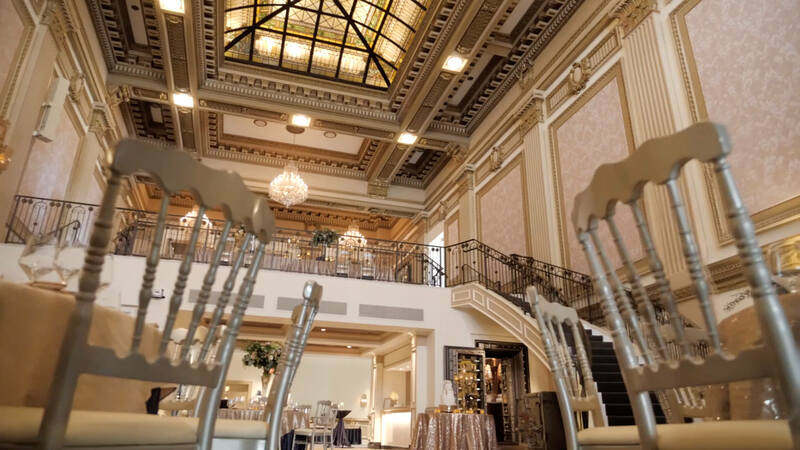 The Great Hall, crowned with a breathtaking 900-square-foot stained glass ceiling, boasts authentic Hess Chandeliers, gold-leafed molding, fluted columns, and a signature bar custom fit into one of the property’s four antique vaults. An intimate speakeasy awaits guests below the Great Hall. 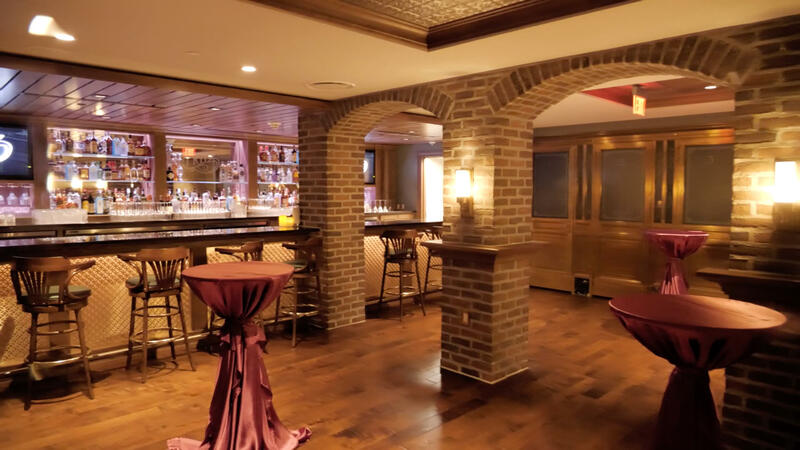 Equipped with a custom bar built in the style of an authentic Chicago taproom, the private space creates the perfect atmosphere for a cocktail reception or social occasion. The Lehigh Valley Trust Company is founded in the heart of Allentown, Pennsylvania and immediately begins design on a headquarters to reflect its propensity for quality. The Lehigh Valley Trust Building opens its doors for the first time, introducing a new level of quality design to Allentown’s classic architectural landscape. A ten-horse team transports four antique vault doors from the Allentown Train Depot to 634 W Hamilton Street. A team of forty men is required to install. 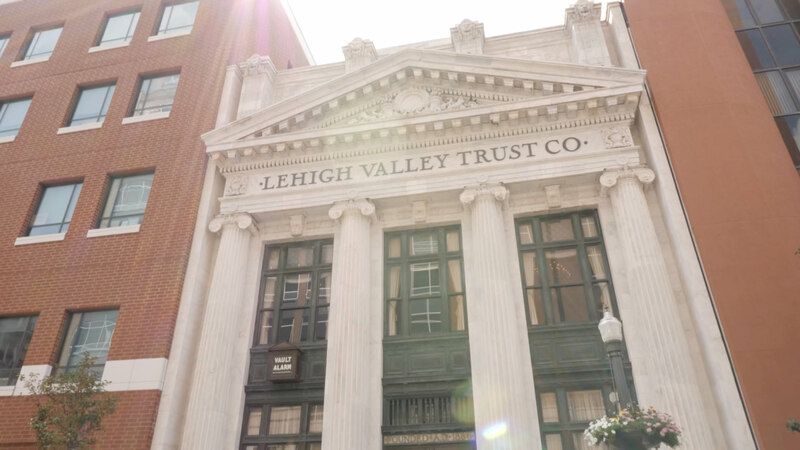 The Lehigh Valley Trust Company remains strong during the Great Depression, and in the process becomes a symbol for hope and prosperity in the Queen City. The Lehigh Valley Trust Company merges with Jenkintown Bank and rebrands as “Industrial Valley Bank”. They remain headquarters in the heart of Allentown. Industrial Valley Bank closes the doors to 634 W Hamilton for the last time. The property is purchased and preserved by Mr. Siegfried Braun of Flemington, New Jersey. Mr. Braun sells 634 W Hamilton Street, and the property sits vacant in the heart of Allentown, Pennsylvania. The property is used primarily for miscellaneous storage. Mark and Zachary Jaindl purchase the historic Lehigh Valley Trust Building at 634 W Hamilton Street. The property immediately undergoes preliminary restoration efforts. An eight-month restoration effort begins in September. The $5 million project will transform the historic property into Vault 634, the region’s premiere venue. The Lehigh Valley Trust Building roars to life as the newly renovated Vault 634. The building will serve as a canvas for spectacular events for years to come.